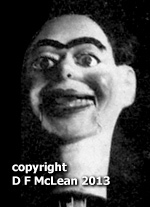 The September 1927 disc starts with a horizontal white bar followed by one of Baird’s ventriloquist’s dummy heads. A hand moves in to support the back of the head. After sweeping his other hand over the face, the operator moves the dummy head from side to side. The end half of the disc shows almost no movement with the exception of a hand in the lower part of the picture, adjusting part of the stand on which the head is mounted. From Phonovision, and from two still pictures, Baird had a two different ‘Stookie Bill’ dummy heads which he used them in his experimental days as test objects. The lighting was sometimes too intense for his assistants to stay under for any length of time. This is where the Stookie Bills came into their own. It didn’t matter if they were scorched in the heat of the intense lights! I discovered that the photograph (above left) is of the Stookie Bill head used for this Phonovision recording, as seen in the image sequence below. The better-known and older more dilapidated ‘Stookie Bill’ is the one Baird provided in 1926 to the Science Museum along with his ‘Double-8’ apparatus from 1924-25. As a result, the only ‘Stookie Bill’ that Baird had in the labs at the time of this recording is the one in this photograph. Below is a consecutive sequence of frames showing a hand passing over the face. This recording may have been used for the Transatlantic transmission tests in the winter of 1927-28. In the log book for 2KZ (Ben Clapp’s station in Coulsdon) capturing all text transmissions sent encrypted with a simple cipher, there is an entry of the message sent by Baird’s team to Clapp at the receiving end in in New York on 24 Nov 1927, ‘We have new record with face and hand’. It really could be this earliest video recording was broadcast during those experiments, as Baird gave this Phonovision disc to Ben Clapp, Baird’s first engineer. Sequence of frames of Stookie Bill and hand moving over its face. Now all you fans of Carl Sagan’s book, ‘Contact’ and the eventual movie, you can forget about aliens picking up Nazi German TV transmissions from the late 1930s. The low definition transmissions from 10 years before is much easier to detect at great distances, and Baird’s transatlantic television tests were broadcast on an omnidirectional antenna using a high power 3000Watt radio station operating on high-end short-wave. If this Phonovision disc really had been used then it’s likely that the heavily distorted images of Stookie Bill would have been (or will be!) one of the first television images detected by any listening aliens. No wonder we’ve had no visitors! The first of the January 1928 discs is very poor in picture quality. The lighting arrangement for all the recordings is demonstrated well on this disc. As the head moves towards the ‘camera’, the subject appears to move from total darkness into a pool of strong light. Showing none of the faults of their partner, the second and third January 1928 discs show quite agile head movement of the same subject. Detail is good enough to show the eyes opening and closing. The subject, possibly ‘Wally’ Fowlkes (The name Wally is scratched on the disc surface) turns and rocks his head from side to side, and looks up and down. Wally was a general hand who came from the soap works of Oliver Hutchinson (Baird’s business partner). Mabel Pounsford turning her head in consecutive frames. 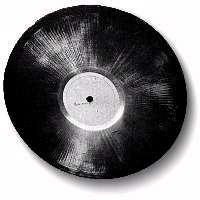 The name ‘Miss Pounsford’ appeared scratched on the surface of the March 1928 disc. This (so the label reads) ‘shows lady moving head and smoking cigarette’. Although she does not smoke a cigarette on the recording, she appears quite extrovert (compared with ‘Wally’) making this in my opinion the best of all the Phonovision discs. Throughout the recording she appears to be talking and generally enjoying herself. Unlike the other discs, the ‘Miss Pounsford’ disc shows all the signs of being physically linked to the Nipkow disc ‘camera’. Every frame is perfectly aligned with the rotation of the disc. This therefore should be the easiest of the discs to restore. In fact it is the most difficult. The lines making up each frame are offset in a pattern as shown on the left. This is most likely some mechanical resonance which causes the disc speed to vary whilst it is being recorded. Gearing back-lash or a universal-joint might be the cause of this problem. To get to the processed result on the right was a major challenge. But the time spent was worthwhile. It reveals now to us a lady full of life and clearly excited by the prospect of being televised. This is in sharp contrast to the other recordings. The recording of “Wally” is staid with slow movements and posed positions. And one can hardly call Stookie Bill’s performance entertaining. We think we know who ‘Wally’ was. We have one picture only of the ‘Stookie Bill’ but it’s definitely the same shape of face. But who was ‘Miss Pounsford’? Channel 4 television in the UK, as part of their ‘The Long Summer’ series transmitted in 1993, put out a plea for information on ‘Miss Pounsford’, after discussing the problem with me. The plea worked as Miss Pounsford’s great-niece responded and kindly provided some photographs. 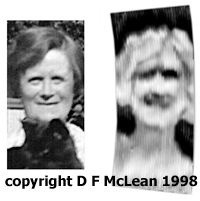 These photographs both confirm that Mabel Pounsford is the subject matter and, most usefully, confirm the scanning direction of the camera as left to right (the opposite of the Baird standard). That does make a big assumption that between 1928 and the time of the photograph, she did not change her hair parting. It also confirmed for the family that Mabel’s claims to have temp’ed for Baird (that is, as temporary secretary) were in fact evidently true.